Buses: This option offers a convenient means of transport. You can plan your bus journey by calling Traveline public transport information on 0871 200 22 33 or visit their website for times and bus stop locations at Traveline Journey Planner. There are buses which travel from Milton Keynes Central Rail Station. All stop locations are clearly signposted from the Station entrance. Cycling: Milton Keynes is a bike friendly city and has dedicated cycle routes and red-ways that stretch across the city. It doesn’t matter if you don’t have a bike as you can hire one from Willen Lake, which is just a short bus journey from your serviced apartment. Walking: Milton Keynes has over 300 miles of footpaths and cycle ways, and there are many more miles of public rights of way in the countryside. These are shown on maps of the area. Leaflets are also available giving details of circular walks from around 2 to 6 miles in length. Rail travel: Milton Keynes is served by three train stations; Milton Keynes Central, Bletchley and Wolverton. The former is on the direct line from London Euston and from Birmingham Central. It is also within a short bus or taxi journey to our Milton Keynes apartments. Taxis Services: They cater for journeys in and around Milton Keynes. To book a taxi there are a list of suppliers in the the Milton Keynes business directory. 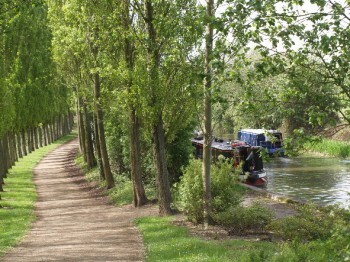 Canal boat: For those wanting to meander through Milton Keynes and yonder! This is a thriving City with many travel options to best suit your needs. If you fancy visiting and need accommodation, contact a Cotels representative to discuss a serviced apartment booking.